San Patricio was an Irish settlement founded by empresarios James McGloin and John McMullen in 1829. They had been granted permission to settle 200 Catholic families which were mainly recruited from New York. First residents were lodged at the old mission at Refugio in the fall of 1829 before choosing a site on the Goliad to Laredo Road where the Atascosito Road forded the Nueces River. The move was completed by 1830 but conditions at the settlement were extremely primitive. An official townsite four leagues square was granted by Mexican Land commissioner José Antonio Saucedo in late 1831 and was declared Villa de San Patricio de Hibernia to honor St. Patrick, the patron saint of Ireland. In 1834 the town dropped the extra Spanish baggage and the town took on the simplified name of San Patricio. In 1836 the Matamoros Expedition led by Col. Francis W. Johnson began to march on Mexico, but were met by Gen. José Urrea's troops and defeated before they could get started. The dead from the battle of San Patricio were interred in what is now known as "the Old Cemetery on the Hill." Families fled the threat of future attack and retreated to Victoria, leaving behind their livestock and property. The town became a ghost town for the first time and remained as such until the arrival of Gen. Zachary Taylor in 1845. Troops were stationed in San Patricio and it slowly returned to normal. 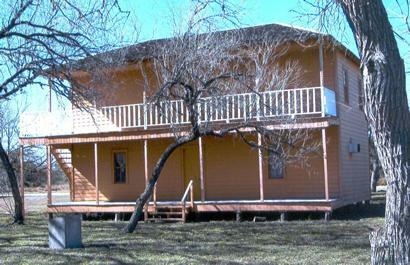 San Patricio was designated the county seat by the Texas Legislature on March 17, 1836. A post office was granted in 1848. The town was on the Cotton Road and the valuable cotton trade and the open country attracted bandits who gave the area an unsavory reputation. In the 1880s the town had a population of 200 which had doubled by 1890. In 1876 two schools were established: St. Paul's Academy for boys and St. Joseph's Convent for girls. In 1894 Sinton was declared to be the new county seat and San Patricio declined accordingly. The town was disincorporated in 1901 and the town was virtually abandoned - becoming a ghost for the second time. In 1872 the City of Corpus Christi was seeking to annex land on the Nueces River which included the former town. This land-grab rallied area residents and they reincorporated San Patricio in August of 1972. The fight rekindled interest in the town's history and the San Patricio Restoration Society has since built replicas of the towns early buildings - including the 1872 courthouse. The population has declined in recent years from 369 in 1990 to 318 for the 2000 census. Robert H. “Sarge” Cummings was known as a master of the long loop, a cowboy term for rustler. This old coot was loved by all, except for maybe the Texas Rangers. Children were ecstatic whenever he came to visit a spell. Some would crawl under his chair just to spin the rowels on his spurs as he spun tales of the wild west.